I mentioned last week that we'd look at the roadmap this week. I'm actually still working on that, so will post the 2018 roadmap next week instead. But I do have a version update this week which adds some useful tools to our images field in the admin (InputfieldImage), and I think this is one that both you and your clients will find really handy. On several occasions, I've had clients ask me "How do I fix this photo"? Usually that means that the photo is upside down, flipped the wrong way, or something like that. Despite cameras storing orientation data (which PW detects and uses), there still seem to be regular occasions where things just don't end up quite right with the photo that a client is using (for whatever reason). I suspect cameras make a best guess about intended orientation, which isn't always right. Whatever the reason is, the need comes up regularly enough to make me think we needed a solution. I had tried adding the capability to our existing image editing tool a long time ago (the tool where you can crop and resize), but it didn't work so well there for various reasons. One being that it's just too slow of a process if you need to apply the same exact action to a bunch of images. The best way to demonstrate is just to show you a couple of screenshots. In this first screenshot, we can see an InputfieldImage with different actions applied to the images. The "duplicate" action was used to create several different copies of the same image. 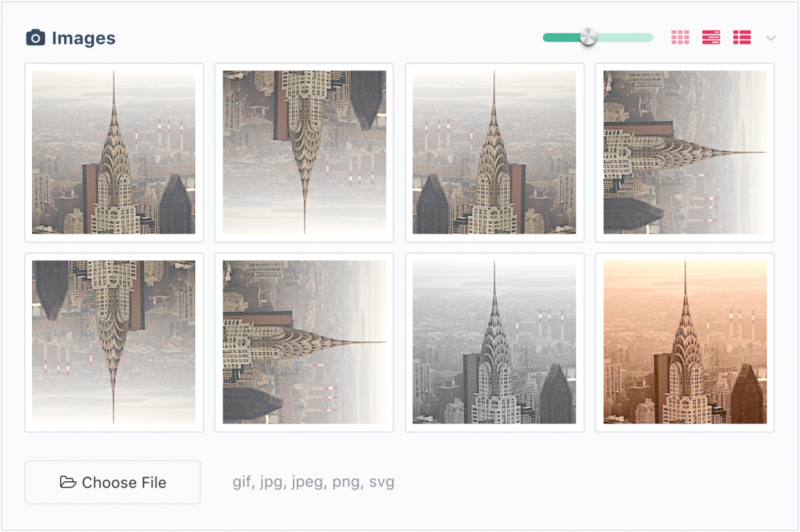 The first image is the original, and the others are either flipped, rotated, or have had color adjustments. The next screenshot shows how the actions are applied. There is a new “Actions” select box next to the existing Crop and Variations buttons. You can select an action here, and it will be applied when the page is saved. I've also updated our ImageSizer engine modules (ImageSizerEngineGD and ImageSizerEngineIMagick) to support all of these actions via newly added API methods. Whether using the default GD functions, or the optional IMagick module, you'll get equally nice results from these actions. However, in my experience so far, the IMagick module can produce results a little more quickly, while also using less memory. This also means you can process larger images with IMagick that might exhaust memory in GD. It is most noticeable on off-camera photos with the Rotate action, which is particularly memory intensive in GD, but doesn't appear to be in IMagick. But if you aren't dealing with giant off-camera images, then I think you'll be equally happy either way. Should you want it, just as a reminder, the IMagick module is included with the PW core and you can install it from Modules > Install > ImageSizerEngineIMagick, so long as your PHP installation has the Imagick module present. Thanks to Horst for creating this module, which was added to the core many versions ago. I hope that you all are having a great start to the New Year, and we'll see you back here next week hopefully with the 2018 roadmap! As always, for the latest ProcessWire news, check in at the ProcessWire Weekly. Have a great weekend. Great addition which will be very useful. Just to echo Ryan's comments, enable the Imagick module if your hosting allows - it is a big improvement over GD. 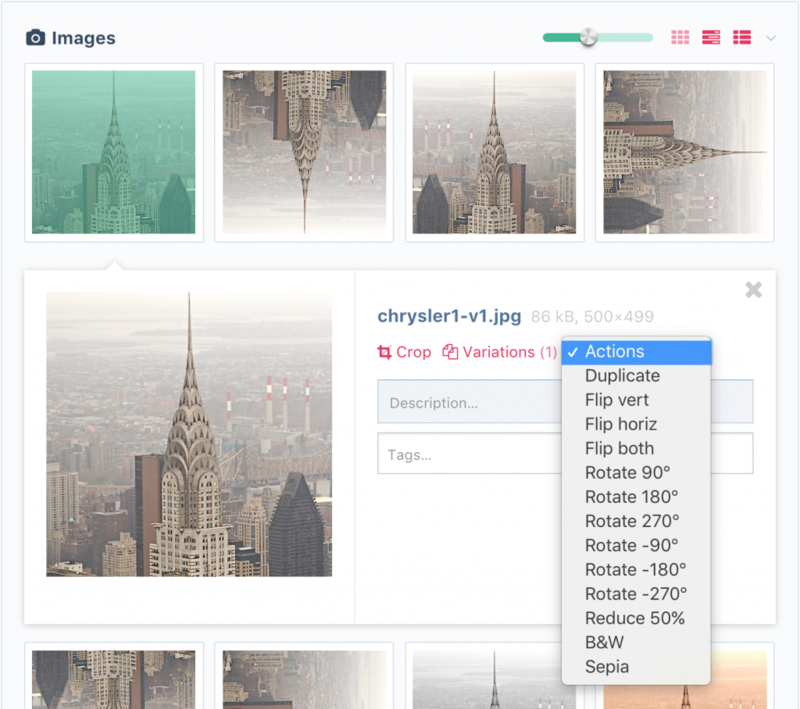 One feature request that comes up very often with our users is being able to crop in predefined canvas relations (i.e. 4:3, 16:10, custom) so that the image doesn‘t get cropped awkwardly by the system. Thinking of the seperation of content and display, the best way to implement such a functionality would probably be with the variations dialogue. Maybe I'm just dreaming up loud but as PW is reading the orientation data (which PW detects and uses), couldn't it also read and write LatLng to e.g. the $page->map->lat and ->map->lng fields? In some cases, this would be extremely useful if this option would exist out of the box!